You can be a spiritual traveler, whether you travel physically to new places, or as you travel through your own life. Exploration and wonder are available everywhere. We are on a creative journey. Our creative work is to honor our inner spirits, explore realities of others, and fashion our discoveries into lives of love, joy, and passion. Join me as I share with you my travels, both inner and outer. May you be inspired to begin and share some spiritual travels of your own. 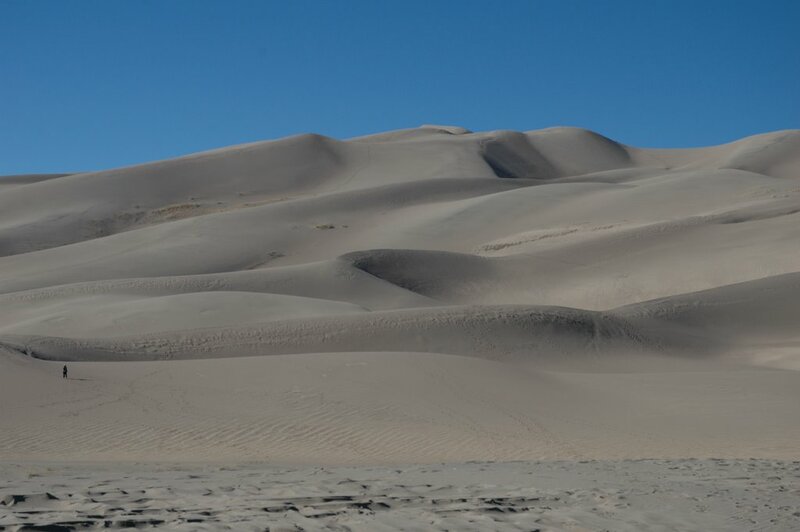 There's a certain feeling that I'm attracted to....I loved the sensuous flow of the sand dunes in southern Colorado (see below), and now here I am again with that feeling in....Houston, Texas! I now live within an easy walk to the location of this sculpture. It is Michael Somoroff's installation, "Illuminations." It was installed next to the Rothko Chapel , (which is itself quite an inspiring space), next to the wonderful deMenil Museum, and around the corner from the Byzantine Chapel....all powerfully spiritual and inspiring company. While the overall shape of the sculpture is beautiful, I was drawn to the shadows inside and the swirling way that it captures the light. Every time I visited it, the form felt different, depending on the time of day and the weather. But it never failed to perk my creative curiosity, and to bring me peaceful and uplifted feelings. One day when I was there a woman pulled up in her SUV, meditation type music pouring out of the windows. She stopped, kicked back in her seat, listening, soaking in the vision and feel of the sculpture. After about 5 minutes she drove off. 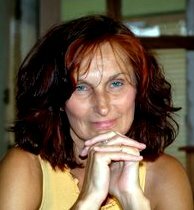 I'm thankful for a spiritual traveler's experience here in my home. 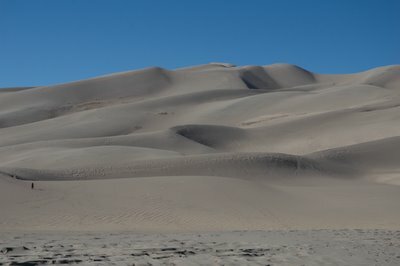 When you first come to the entrance to the Great Sand Dunes from the parking lot, you see people far and high who appear to be walking aimlessly about on the sand. Why did they walk that far?, you wonder. It looks totally boring. But the dunes seduce you. Each step brings new angles, new shadows, ripples in the sand, shadows of the grasses on the sand. Each step brings you to a new valley, or bowl, or ridge, that can’t be seen when you are at the base of the hills, or on the flat riverbed. Like a golf course, you can’t see many of the subtleties until you are playing the course, actually right there, active, not observing from a distance. And such is life. We often see people doing things that look aimless and uninteresting and wonder why they do them. We should hold our judgment or assumptions until we have been on their course, living their reality, and perhaps we will see that their lives are not so aimless after all or that what they were doing could actually be of interest to us too. Being in New Mexico has been a huge lesson in "never saying never.” I’ll never live there. I don’t get it, why do people live there? I used to say to myself. But I was bewitched...by the people, the beauty and the sheer adventure of being able to be myself. I now see that I can live anywhere at this point in my life, or at the very least, I have a lot more openness to what may not initially attract me strongly. I have gotten my free spirit, “curiosity about everything” vibe back again. My lifestyle in 2005 has allowed me to live in places that in the past I might not have chosen, and to experience realities about which I previously did not feel intense interest. Through stretching, being in the adventure mode, and honoring who I am, I have rediscovered the part of me that loves the thrill and mystery of the unknown, no matter where it is. My curiosity is strong and my enjoyment of new realities is deep. Everywhere I go now is a foreign country. Perhaps I will settle there, or perhaps I will move on. The point is to bring in the new experiences, live fully, and appreciate all of reality. “.... there was another experience that I actually liked the best. 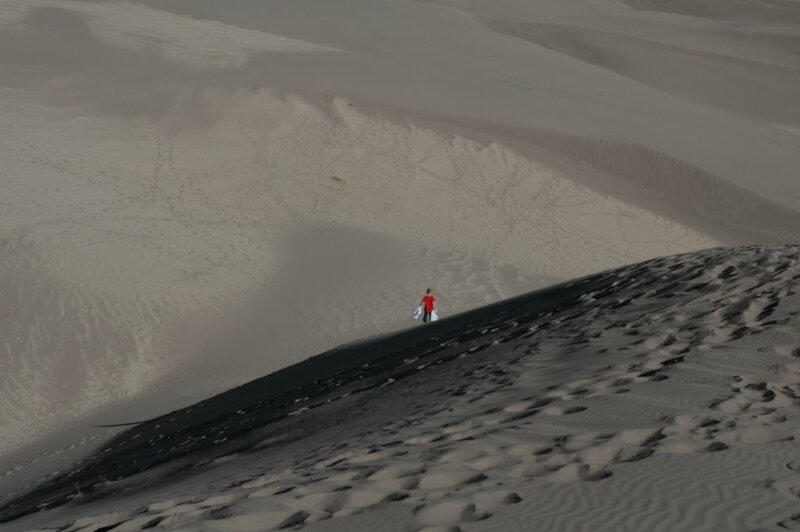 I found places in the dunes where it felt like you were in a bowl. With mounds of sand rising high around me, there were no markers to orient me to where I was. I couldn’t see the mountains behind me, I couldn’t see the highest ridge ahead of me, and the sand walls blocked the sun. I was surrounded by and totally in the essence of sand and sky. 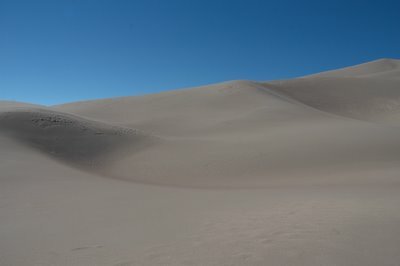 ...I realized at one point as I walked, breathed, absorbed, and reflected, that my dunes experience was a great analogy of how I am currently living my life. A great part of me loves being in the unfamiliar. I like having home bases, places to ground me, but I don’t have to be in them very often. I am curious, always wondering what is beyond where I currently am, in thought and in physical reality. I know that there are many realities and perspectives out there that I can’t even imagine, and I take joy in finding ways to discover and experience them. Traveling and mini-adventures like the Sand Dunes experience allow me to embrace new angles, new ways of seeing things, and new ways of being in the world. They are part of the practice of expanding my own personal consciousness, and being fully in the world. As adventurous as I am, I can also be a bit timid. I get an idea and go after it or bring an experience into my life knowing that it will really stretch and inspire my imagination. But then sometimes I find my mind drawing back, trying to keep me from leaping into the full experience of what I have set up. As when I first saw the dunes and was not instantly attracted, I sometimes have to push myself to take that extra step. I tell myself to try it, that I can always leave, that there was a reason why I chose this experience in the first place. I know that there is many a surprise around the corner.